Park Forest Village is an unincorporated area and census-designated place (CDP) in Patton and Ferguson townships, Centre County, Pennsylvania, United States. 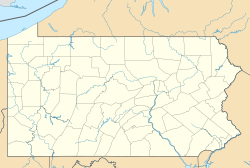 It is part of the State College, Pennsylvania Metropolitan Statistical Area. The population was 9,660 at the 2010 census. Park Forest Village, created in 1956, was the first large suburban development near State College. This neighborhood won several national awards for its design, which moved away from the straight streets and clear cutting typical of post World War II suburban developments. The use of gracefully curved streets and the retention of trees established a pattern for future developments everywhere. Park Forest Village is located in southern Centre County at 40°48′4″N 77°54′34″W﻿ / ﻿40.80111°N 77.90944°W﻿ / 40.80111; -77.90944 (40.801060, -77.909423). The eastern end of the community touches the northwest corner of the borough of State College. The northern edge of the community is defined by U.S. Route 322 Business (North Atherton Street). According to the United States Census Bureau, the CDP has a total area of 2.45 square miles (6.35 km2), all of it land. The subdivision was originally developed on 1,000 acres (4.0 km2) of land known as part of the Barrens in Patton Township by J. Alvin Hawbaker, a well-known real estate developer in State College. Mr. Hawbaker's assistant designer was a noted architect/landscape architect Carl W. Wild, who insisted on focusing on street tree-plantings to define each street and maintaining as many naturally growing trees, as possible. Through their company, Park Forest Enterprises, they created the cul de sac and curved streets design of Park Forest Village which ended up yielding more housing units per square mile than the conventional city grid pattern. Park Forest Village also utilized several localized parks so that common recreation areas would be accessible to each neighborhood in the subdivision. The landscaping of each homesite also retained as many native trees on the original land as possible, giving each property abundant trees and a mature, long-term, lived in look as opposed to young sapling trees planted at the time most conventional homes were constructed that took years to grow and mature. As the building of the subdivision progressed, utility lines were buried so that telephone and power line poles became unnecessary, giving the streets a cleaner design and look. J. Alvin Hawbaker also pioneered the "Gallery of Homes" real estate marketing approach, which resulted in the sale of thousands of housing units within the area now known as Park Forest Village. As of the census of 2010, there were 9,660 people, 3,923 households, and 2,092 families residing in the CDP. The population density was 3,971.3 people per square mile (1,533.3/km²). There were 4,029 housing units at an average density of 1,656.4/sq mi (639.6/km²). The racial makeup of the CDP was 78.5% White, 3.8% Black or African American, 0.1% Native American, 10.8% Asian, 1.0% from other races, and 2.6% from two or more races. Hispanic or Latino of any race were 3.2% of the population. There were 3,923 households, out of which 23.7% had children under the age of 18 living with them, 43.9% were married couples living together, 2.6% had a male householder with no wife present, 6.8% had a female householder with no husband present, and 46.7% were non-families. 24.0% of all households were made up of individuals, and 6.4% had someone living alone who was 65 years of age or older. The average household size was 2.45 and the average family size was 2.87. In the CDP, the population was spread out, with 17.0% under the age of 18, 25.0% from 18 to 24, 26.0% from 25 to 44, 21.4% from 45 to 64, and 10.6% who were 65 years of age or older. The median age was 29 years. For every 100 females, there were 105.5 males. For every 100 females age 18 and over, there were 106.9 males. The median income for a household in the CDP was $51,587, and the median income for a family was $74,675. The per capita income for the CDP was $29,387. About 13.0% of families and 22.9% of the population were below the poverty line. However, traditional measures of income and poverty can be very misleading when applied to a community like Park Forest Village which is located only a few miles from Penn State University and has many student residents. ^ "Geographic Identifiers: 2010 Census Summary File 1 (G001): Park Forest Village CDP, Pennsylvania". U.S. Census Bureau, American Factfinder. Retrieved April 20, 2015. This page was last edited on 9 July 2018, at 16:13 (UTC).